Irrigation is often regarded as the "set it and forget it" alternative to hand watering your lawn. Although this is true, there's still a few things to know about your sprinklers and when you should be using them. First, you need to know how long to water your lawn. A healthy lawn requires about 1 inch to 1.5 inches over the course of a week. Changes in seasons will effect how much water your lawn needs. An easy way to know how much is adequate is by sticking a 6 inch screwdriver into your grass. If it doesn't go in with ease, you’re not watering enough! When setting your system's timer, take into account that the recommended lawn watering frequency is 2-3 times over the course of the week. You should also be sure to check your county’s watering restrictions. Not abiding by these restrictions could result in a violation notice and a fine. 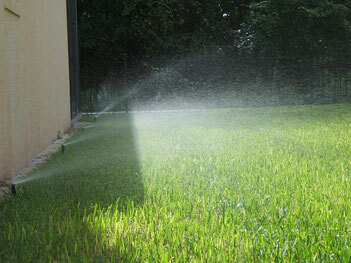 Aside from how long and how often to run your irrigation system, there is a preferred lawn watering time. If you wait until midday, the heat will evaporate the water too quickly. This prevents the grass from having a chance to properly absorb it. Always set your irrigation's timer for the early morning before temperatures become too high. An often overlooked lawn irrigation tip is to inspect your equipment once a month to make sure that everything is working properly. Your sprinkler heads are also important to check because they will eventually wear out or become damaged. Looking them over while your system is running is a good way to know if your pop up sprinkler heads are in fact popping up, as well as spraying normally. See our system care tips for more on what to look for. If you do notice any problems with your irrigation system, call Ludlow's Lawn Services at (407) 456-1369. We offer free estimates on any needed repairs or service to accommodate our customers in Davenport, Kissimmee and the surrounding areas. I finally have a lawn and want to take good care of it. Thanks for the advice about how you should water your lawn 2-3 times a week. It would also be smart to install a sprinkler system so that your lawn gets the same amount of water everywhere. There is a favored yard watering time. On the off chance that you hold up until early on afternoon, the warmth will dissipate the water too rapidly.